Give yourself the most satisfying condos for rent that Pattaya has to offer. If you plan on staying in Thailand for a while - why not get as many options as possible? This little gem is called 'Jomtien'. • and nicer beaches than the Pattaya Beach Road area and even Naklua Wongamat. Jomtien is more of a residential area and still has all the conveniences that central or south Pattaya offers. At the same time it's still just 10 minutes from Walking street. So get the nightlife and the relaxation out of where you live. When I stay in this part of the world I love these particular places. These condos are in a nice park like developement and great for families. I personally love this place because it's a little community of its own. You can easily meet people from diverse backgrounds at the pool. You also get extra security guards and washing machines in the complex. This saves time and energy for washing your clothes. You also get to sleep extra safely at night! A very popular condominum developement with great facilities. You can get to the beach within minutes. You also have a nice big pool to do laps in. Do you play ping pong? You also get access to free ping pong tables if that's your thing. 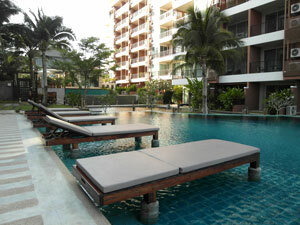 Fine living in Jomtien about 750 meters from Jomtien Beach with very nice condos. Do you like to play pool? You get your own pool table and bar area. Whenever you're hungry for good Thai food you can also enjoy your own restaurant just minutes from your condo. Top location south end of Jomtien beach road with very nice facilities and condominiums. Are you into working out? You get a proper gym and a tennis court (if you're into tennis.) You can also lounge by a big pool whenever you feel like it. This is a very central location at the north end of Jomtien beach road. It's also close to the nice Dongtan beach (famous for being the 'gay' beach in Pattaya.) You also get to be walking distance to a quaint restaurant that you can go to for breakfast. One of the best locations in Jomtien and yet inexpensive. Right on Jomtien beach road if you want to go swimming or just grab a beer at the beach. The baht buses are nearby too if you want to go to Walking street conveniently. Close to the well known cosy beach on Pratumank hill between Pattaya and Jomtien. You also get to enjoy having a steam room and jaccuzzi. Feel extra safe as 24 hour security patrol the complex. Get to be walking distance to Pattaya's waterpark. It's also close to Dongtan beach. You also have access to inexpensive condos for rent pattaya. So...Why Settle For One Good Thing When You Can Have it All? Give yourself the chance to relax and do what you love during the day...and go out to party at night! I recommend getting a condo in Jomtien. Again it's a quick baht bus ride to walking street and you still get all the fun that Thailand has to offer. The expats who've been in this part of the world eventually all move to Jomtien at one point and I'm sure you will too. In any case - where you want condos for sale or rent...let's make your Pattaya trip as fun and relaxing as possible.